Ocean Development | Business Activities | FUKADA SALVAGE & MARINE WORKS CO., LTD. Since our founding, we have used a century of experience and success, our quality salvage fleet and equipment, and the human resources that have inherited our technological prowess, to successfully salvage numerous vessels. With the recent increase in vessel size, the severity of maritime disasters continues to increase. There are growing numbers of voices calling for global marine environment conservation as well, which requires swift action for accidents and appropriate salvage activities to prevent major marine pollution. 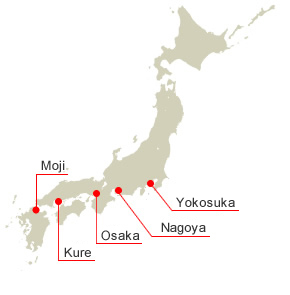 We have five bases across Japan to respond to emergency salvage requests. These bases have both the personnel (engineers, divers, workers) and the equipment (work vessels, resources) on hand, allowing for rapid response. And through partner companies and the creation of a salvage network, we can rush to any distress location under any conditions from a number of other Japanese ports. And as a Japanese member of the ISU (International Salvage Union), we are allied with salvage companies the world over, allowing us to handle international salvage operations, large-scale oil pollution clean-up across multiple borders, and so on. We work tirelessly day and night to protect the safety of vessels and the marine environment that connects us all. *Visit our Contact page for any non-emergency contact.